The problem of pet overpopulation is striking when you consider that millions of cats and dogs are euthanized each year because they don’t have a home. After visiting a Hawaii animal shelter with an innovative program that allows visitors to take dogs on a day-long field trip before making a decision to adopt, I was inspired to do some research into pet adoption: are there ways to improve the process and make it easier for people to adopt pets? I decided to focus my research on dogs and my first objective was to understand the current dog adoption experience. Using structured interviews and an online questionnaire, I collected data from more than fifty adopters on their adoption experience and the challenges they faced. I combined the data with documentation from a number of shelter websites to map out the different stages in the process and the corresponding actors. This experience map contains a summary of the stages in the adoption process and the challenges identified at each stage. Based on the needs and challenges that I uncovered during my research, I identified some opportunities for potentially improving the adoption process. 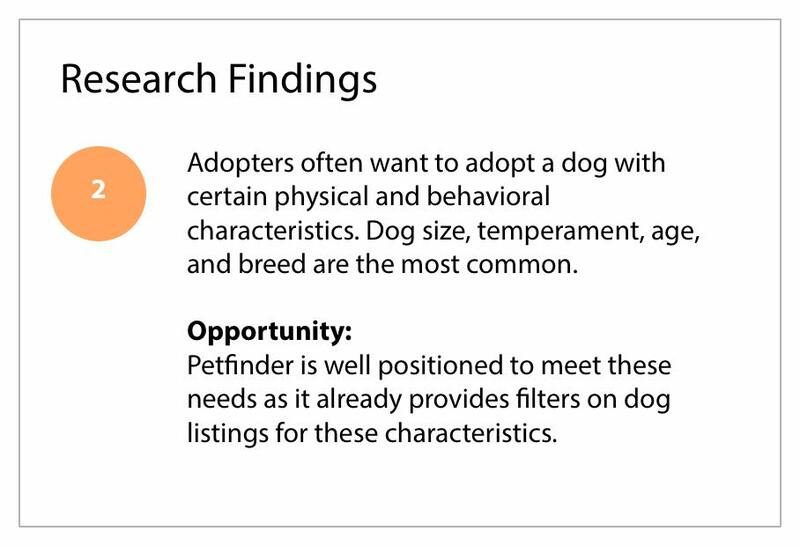 I decided to frame these opportunities around the Petfinder website given its established popularity as a dog adoption channel in my research. I’ve described some of these opportunities in more detail below, including mockups and process flows. Note that although these opportunities are grounded in user research, they of course require further study with adopters and adoption organizations to validate them as viable solutions. In my research, I found that people sometimes have to wait for longer periods of time to find a dog matching their desired characteristics. This is especially true for adopters looking for purebred dogs. 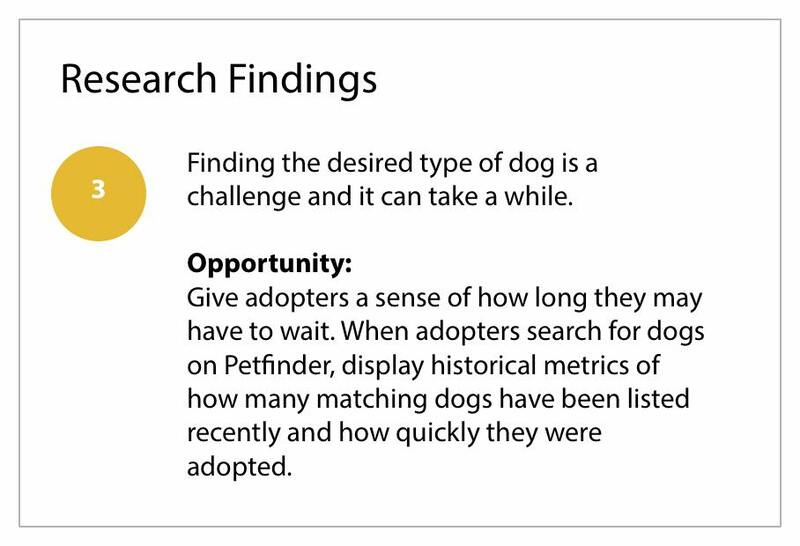 By adding metrics to search results indicating how many matching dogs have previously been listed as well as their average listing time, adopters can get a sense of how long they may need to wait for a dog matching their desired characteristics. A challenge that adopters expressed in my research is that it can be difficult to assess a dog’s temperament prior to adoption. For example, adopters with existing pets or children wanted to know how the dog behaves with them. Likewise, some adopters are looking for a calm temperament while others prefer a more energetic dog. 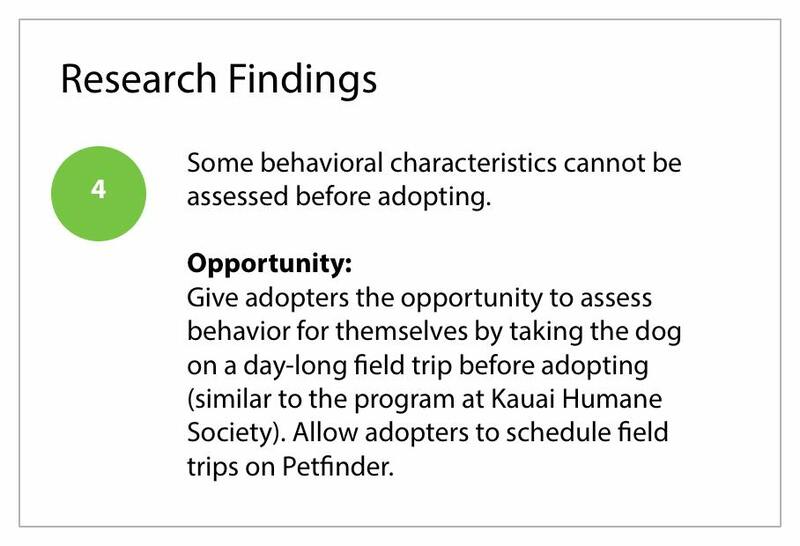 One approach that has shown to be successful at a shelter in Hawaii is to allow adopters to take the dog on a day-long field trip. Of course, implementing this would require working with shelters and rescues to set up the field trip program. 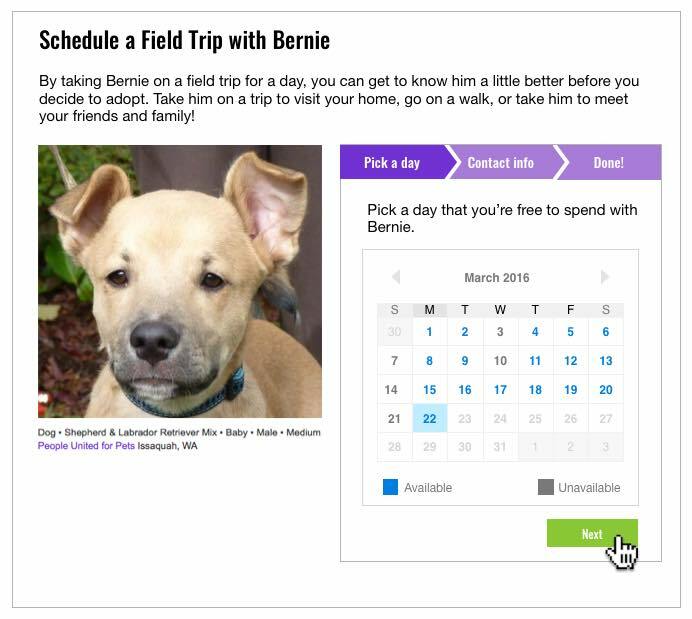 This mockup demonstrates the adopter scheduling a field trip for a dog listed on Petfinder. Some of the challenges that adopters highlighted in my research stem from the traditional rules in the dog adoption marketplace: adopters apply to adoption organizations for a single dog and the organizations determine the best fit among all applicants. This process can lead to a competition for available dogs and my research indicated that the atmosphere can be unpleasant. Additionally, the adopter is required to constantly search and apply for dogs that become available. 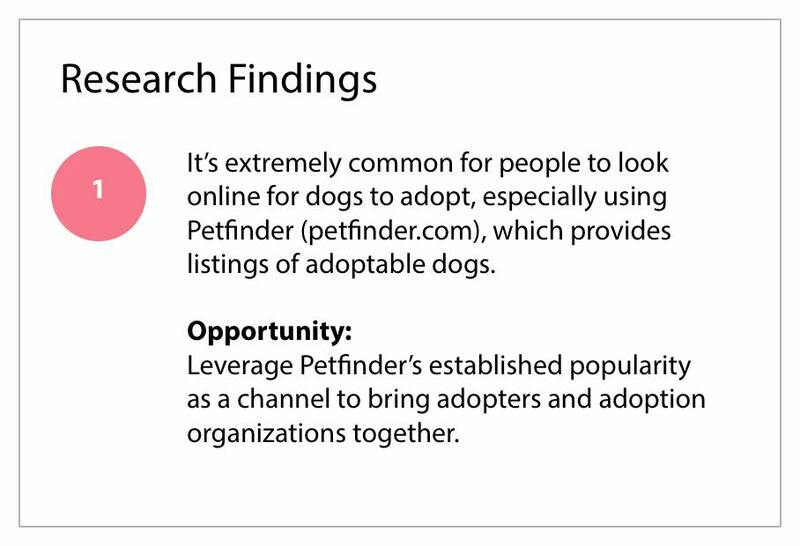 When thinking about two-sided markets that are similar to dog adoption, I realized that the job marketplace is a reasonable analog: job seekers constantly search and apply for open positions and organizations hire the best applicants. 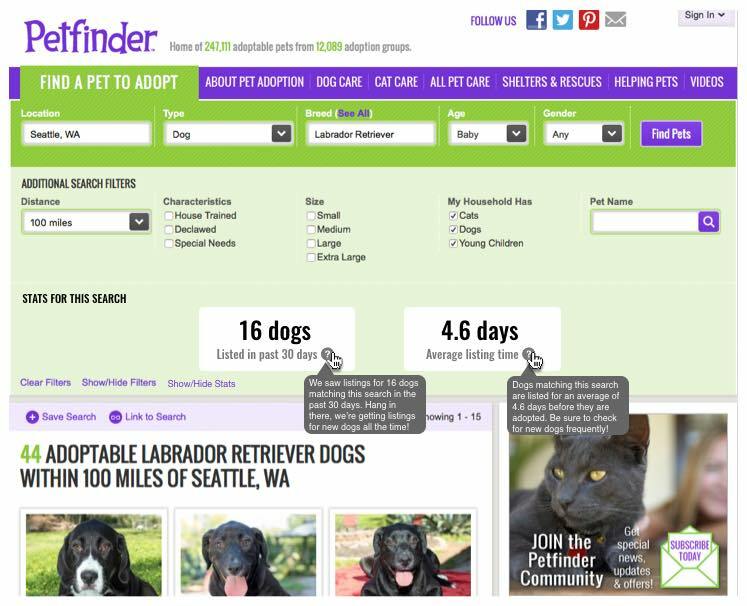 What if we flip the dog adoption marketplace on its side? 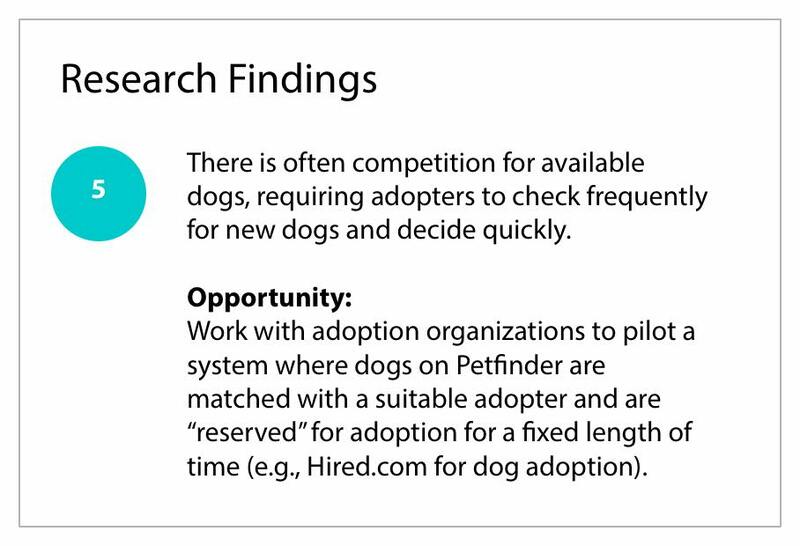 An approach that could address adopter challenges would be to try what Hired.com has done for the job marketplace: adopters fill out a profile indicating their intent to adopt a dog with certain characteristics and adoption organizations then have a time-limited opportunity to match available dogs to a single adopter. The matched dogs are “reserved” for the adopter for a limited amount of time before being re-matched in case an adoption is not completed. 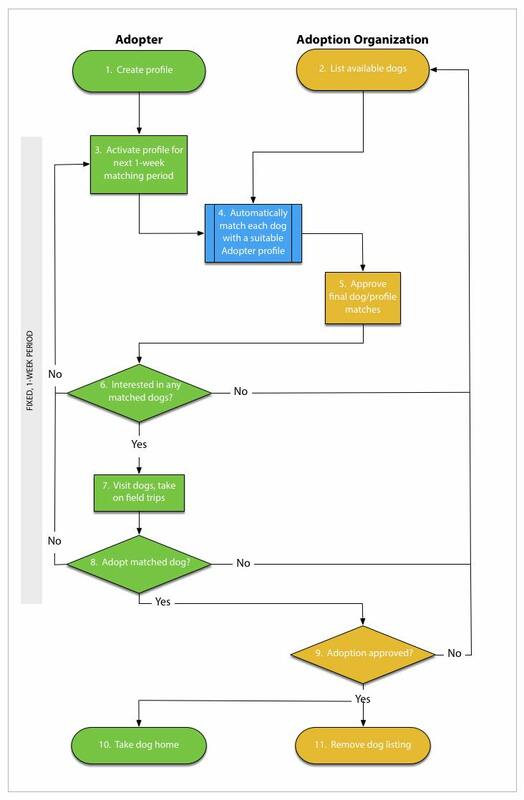 I created a process flow for this proposed system on the Petfinder website. Of course, this system requires further validation of its viability with adoption organizations.